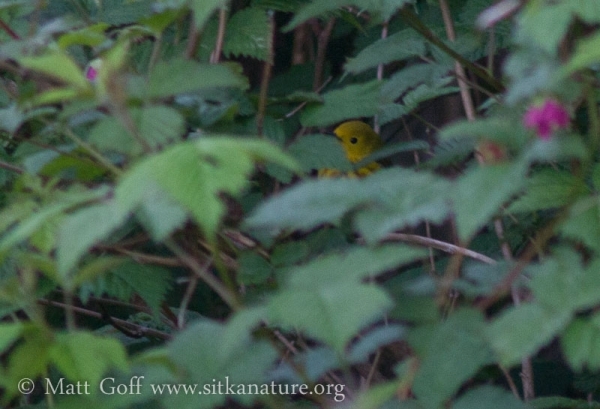 Recently I have been asking people if they have seen any Yellow Warblers this spring. While not an especially common species along the road system in Sitka (mostly due to lack of preferred habitat, I suspect), in many years they are show up around the first week of May. However, this year there I had heard of no reports, so I was curious if there were any around. Early this morning I went for a walk around the neighborhood and heard a bird singing. I thought it might be a Yellow Warbler, though I am not so familiar with their song that I easily remember it, especially the first time I hear it each spring. The bird was moving around in a dense salmonberry thicket. From time to time I could see movement through the branches and leaves, but I was not able to get a good look. Eventually I was able to get the photo above in the brief moment it was partially visible through the leaves. Until I was able to look at the picture more closely, I wasn’t confident that it was a Yellow Wabler, but the look of its face and the streaks on its breast clinched it for me. This entry was posted in audio, birds, identification and tagged audio, Yellow Warbler. Bookmark the permalink.